This early twelfth century CE image of the New Jerusalem is from the Beatus family of Apocalypse manuscripts and depicts Christ seated on his throne, above the river and tree of life. Produced mainly in Spain between the ninth to the twelfth centuries CE, at monasteries in Catalonia, Aragon, Navarre, and elsewhere, the Beatus Apocalypse manuscripts are all based on the Apocalypse commentary of the eighth century Abbot Beatus of Liebana. They all reflect a similar iconography, quite distinct from the Anglo-Norman Apocalypse iconography that had developed in Northern Europe and is reflected in the Trinity Apocalypse and the Angers Apocalypse tapestry. 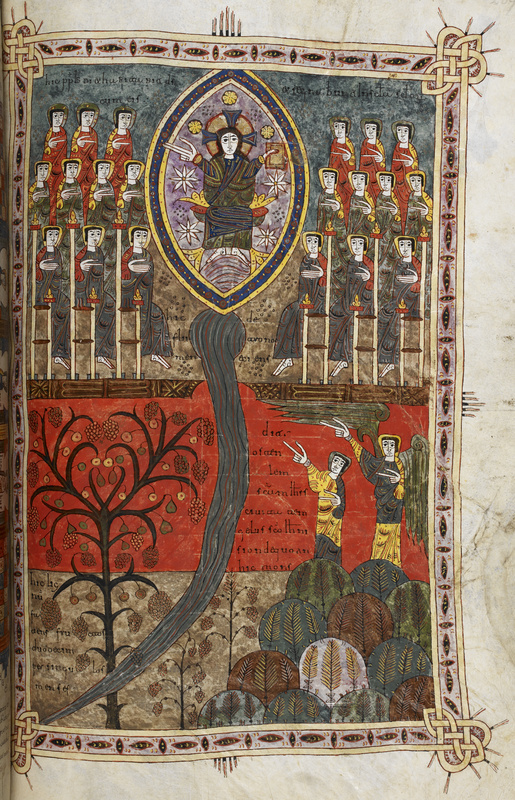 The images in the Beatus Apocalypse manuscripts tend to be uncluttered, dramatic and vividly coloured. This image of the New Jerusalem, from the Silos Apocalypse, is no exception. An angel with very elongated fingers shows John not the descending city of the New Jerusalem but instead the River of Life, descending from the throne of God and the Lamb (Revelation 22:1–2). This throne is depicted as identical with the Heavenly Throne Room described in Revelation 4–5. Thus God/Christ is surrounded by the twenty-four elders, who point at him with elongated fingers. To the left of the river is the Tree of Life. While the text declares the Tree of Life to be growing on both sides of the river—a physical impossibility—the artist has quite sensibly elected to depict it on one side only. This image of the New Jerusalem radiates a reassuring sense of calm but, with its heavy visual divide between the heavenly and earthly realms—evoked via a heavy and ornate brown barrier underneath the heavenly throne room—it perhaps lacks the sense of interactivity between the divine and the human that the text of Revelation is at pains to stress.